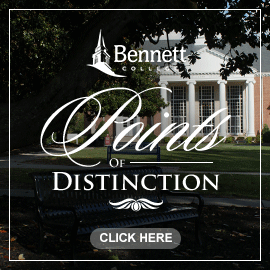 Directions from major highways and interstates to Bennett College. bridge. Continue on Elm St. until you reach Washington St. Take right onto Washington St.
Bennett College is on your right. St. Exit 221. Turn left onto Elm St. Take right onto Washington St.
and get on Wendover Ave./US 70 East. Take right onto Yanceyville St.
Yanceyville St. becomes Dudley St. Follow Dudley St.
Bennett College will be on your right. Rd. Take right onto Lee. St. Follow Lee St. and take left onto Dudley St.
From Highway 29 South take the Wendover Avenue West/Hospital Exit. From Wendover Ave. turn left onto Yanceyville St. Follow Yanceyville St.
Yanceyville St. becomes Dudley St.
From highway 421 North, take Business 40 West towards Winston-Salem. St., cross Lee St. and pass over bridge. Take right onto Washington St.